I’ve posted about The Kitchen Overlord and her amazing books before (including Wood for Sheep and the Doctor Who cookbook), and I’m super excited about her newest project. She’s working with artist Tom Gordon to created a fully illustrated cookbook of various unique (but easy!) geeky recipes. 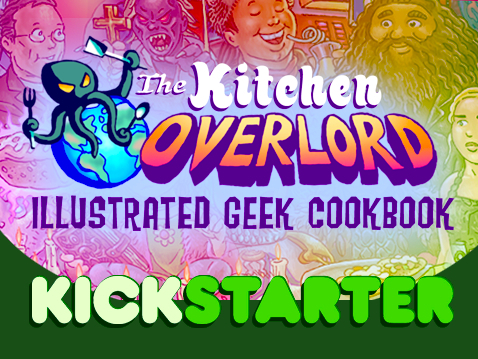 There will be 50 recipes from a variety of fandoms including Alien, BSG, The Princess Bride, D&D, and more! The Kickstarter is already double its goal with over 30 days left. This means that new rewards have been added and a “Carbs Against Humanity” set of cards have been unlocked and are available for download! You can get a copy of the Ebook for a $10 pledge, and an actual copy of the book for your hands for $25. Find out more info at Kickstarter.com! I can’t wait to see the finished product. What recipe are you most excited about?